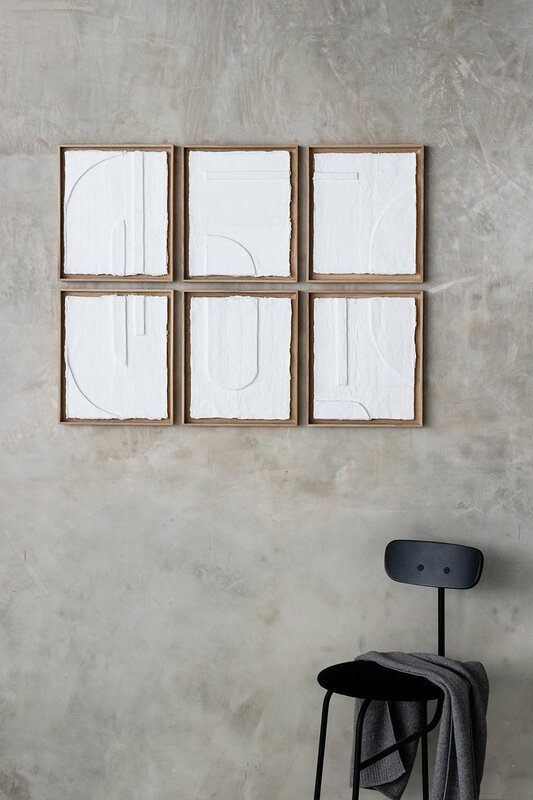 Shapes 1-6 is an abstract and playful series of reliefs. The shapes are spread over six works, which together form one work of Art. You can also choose a combination yourself and create your own composition. All works are framed in a natural solid oak frame. July Adrichem is an artist from The Netherlands. July's passion for colour, material and new shapes, became obvious while working on projects at Piet Boon® for two years. During her time there, she created several styling products used for national and international projects. She worked on new prognoses and created themes for mood books and colour palettes to apply in styling projects. Her graphic design background enables her to have an eye for graphic details and organic shapes in the creation of new products. Nowadays, July is setting up exciting new product lines, such as the Second Skin Collection and the Ceramic Collection, all made by hand.